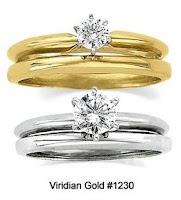 Here at Viridian Gold we sell so-called "Bridal Sets." That's just a handy name for a matching engagement ring and wedding ring, such as our Interlocking Diamond Wedding Ring Set, #1380. Even though the petite wedding band interlocks with the engagement ring at the top, that still does not keep it from moving around on the finger, because the interlock still allows the rings to be separated. And, some of our sets, such as the Tiffany-Style Diamond Solitaire Engagement Rings with Matching Bands, #1230, (also shown here) do not interlock but simply match in appearance. 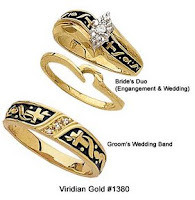 So, if you really want the convenience of having your rings stay together, we offer the option of joining the rings together with gold solder. 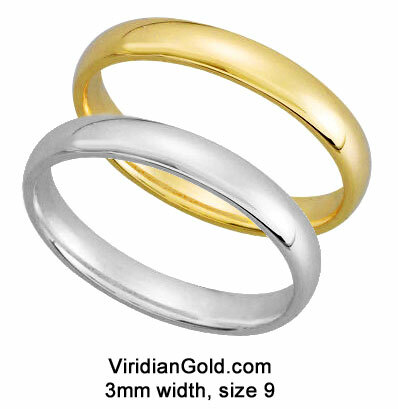 That means that our jeweler will join the two rings on their lower halves with 14K gold. Unlike some jewelers who just put a couple of dots of gold solder, he makes a continuous joint of gold in about a 90-degree arc to join the two rings together, permanently. Though we call it "spot soldering," it is actually a continuous bead of gold solder which is buffed to a gloss to match the rings, and it is virtually invisible, since it is applied between the rings. 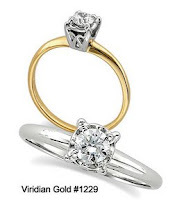 If required, though, the rings can still be separated by an experienced jeweler without damage. Just click the "Buy Now" button for "Join Woman's Rings" on the ring's page to add that additional service to your ring order!